ISIS conquests across northern Iraq have been comprehensive in recent weeks. Taking control of large parts of the region, they declared a Caliphate last month. And one group who have especially suffered at their hands are the Christians that have been a part of the region’s landscape for almost two millenia. Following ISIS’ consolidation of power in the region, these longstanding communities have faced brutal treatment. In what can only be considered persecution and discrimination of the highest degree, ISIS has targeted the Christians of Mosul by daubing their homes with the Arabic letter N – marking them out as Nasarah, Christians. In a concerted and deliberate plan of ethnic cleansing, ISIS then offered Christian families three choices: convert to Islam, pay the Jizya tax (a tax of 14g of pure gold that Christians must pay in addition to normal taxes for the privilege of their faith), or leave their homes. Anyone who could not pay or refused to convert to Islam was threatened with death. In these circumstances and fearing the worst, many chose to flee and Mosul – just recently home to thousands of Christians – has been emptied of this ancient community. Stripped of all their possessions, even medicines, many were forced to walk 70km to safety, eventually heading to Dohuk in the Kurdish region of the country. The 15 Christian families who chose to stay in Mosul, did so by converting to Islam in order to to retain their homes and possessions. But the homes of those who left the city were confiscated as the property of the newly formed “Islamic State”. This forced exodus has ended the significant Christian presence in Mosul that predated the coming of Islam by several centuries. In a region that has seen the rise and fall of many political powers, ISIS’ policies undermine the long co-existence of Muslims and non-Muslims in the region. 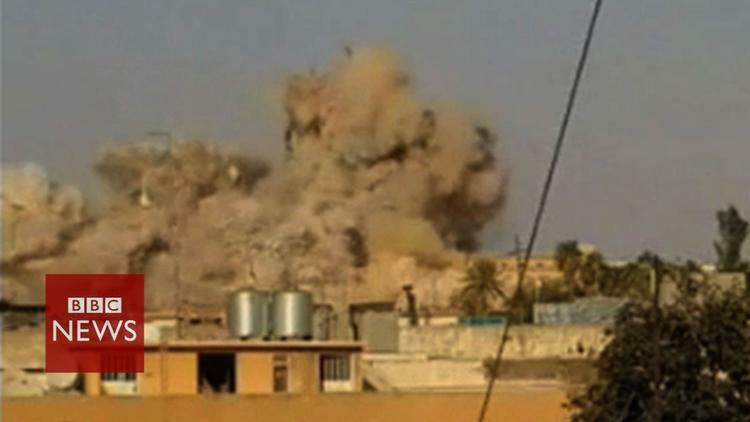 In Mosul, ISIS militants have begun to desecrate the city. They are physically rendering it into their extreme, minimalist interpretation of Islam. And their actions have not solely focused on Christian buildings. The ancient tomb of Jonah (a major landmark in Mosul which was venerated by Christians, Jews and Muslims alike) has been levelled and Shi’a shrines and mosques have been destroyed too. In their bid for “Islamic purity”, the ISIS militants have particularly targeted Christian buildings. The diocesan headquarters of the Syrian Catholics in in Mosul has been torched, having existed since the late nineteenth century. All crosses from the 22 churches in Mosul have been removed and churches have been turned into mosques or destroyed. With Christian communities extending out of Mosul and across the Ninevah plains, ISIS has also extended its focus on the surrounding countryside. Militants seized the ancient Mar Behnam Monastery, reputedly founded on the spot where the royal Sassanid brother and sister, Behnam and Sara, were martyred in the 4th century then home to Syrian Catholic monks. The monks were expelled and refused permission to take any of the holy relics housed in the monastery. This raises real fears that these historic items, together with the manuscript collections there, will be destroyed. There is also the likelihood that the monastery, parts of which date from the 13th century and number amongst a handful of buildings in Iraq that survive from the Mongol Il-Khanate period, will be desecrated and destroyed. Christians have lived in Iraq since close to the religion’s birth – they first began to settle in the region around the 2nd century and must be counted as amongst the earliest witnesses to the Christian faith. Their churches and monasteries have been an integral part of the landscape for centuries, producing some of the finest examples of architecture. The communities have lived in relative accord with their Muslim neighbours down the centuries, each contributing to each other’s cultures. Following the 2003 Allied offensive, Christians in Iraq have endured many atrocities, the most notable being the massacre on October 31 2010 at the Our Lady of Salvation Church in Karrada, Baghdad. Now the Christians, who have contributed in many different ways to the culture and economy of Iraq, do not meet ISIS’ stringent definitions of who is acceptable. Their persecution raises the real possibility that this ancient community will be eliminated from its homeland in Iraq. It also marks the end of the notion of “civilised dialogue”, a tenet that has lasted since the Abbasid period where Muslims and non-Muslims lived alongside each other. It is paradoxical that ISIS, who aim to emulate the Caliphate of old, instead adopts tactics that can only be described as brutal and befitting of uncouth barbarians. Dr. Erica C D Hunter is the Lecturer in Eastern Christianity, Dept. for the Study of Religions, SOAS. She is also Chair, Centre of Eastern and Orthodox Christianity, Department for the Study of Religions, SOAS, University of London. She is the organiser of the highly successful annual Christianity in Iraq Seminar Days (inaugurated 2004). For further details see easternchristianity.com. In 1987 she first met the Christian communities of Iraq. Between 1989-1990 she was the Gertrude Bell Fellow of the British School of Archaeology in Iraq and worked on the collections of incantation bowls (written in Syriac, Aramaic and Mandaic) in the Iraq Museum. She still maintains close contacts with the Christian (and Mandaean) communities both in Iraq and in the diaspora.